Forget Botox, smile away those laugh lines with snake venom. 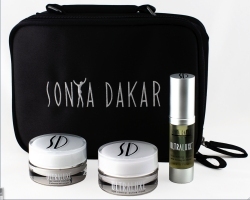 Found in the new Sonya Dakar UltraLuxe Jet Set Travel Kit, snake venom has the same muscle relaxing properties as Botox, but without the use of needles. Available for dry/normal and combination/oily skin, so there’s one made just for you. No matter where your travels take you, your skin will always look great! SonyaDakar.com, $98.